ABC News is reporting a resurgence in the use of laughing gas, or nitrous oxide, by U.S. hospitals for women in labor. 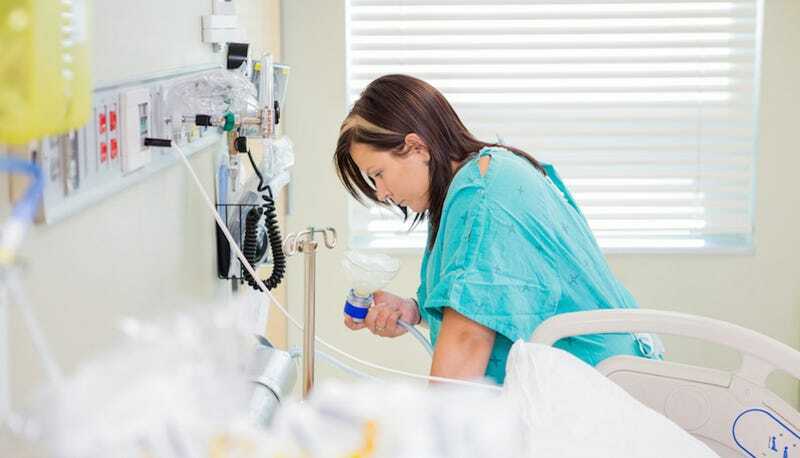 Long a popular choice in delivery rooms across Europe and Canada, the once-common nitrous oxide was, according to Minnesota midwife Kerry Dixon, pushed aside in the U.S. in the 1930's in favor of the epidural. However, "The average cost for a woman opting for nitrous oxide is less than a $100, while an epidural can run up to $3,000 because of extra anesthesia fees," Dixon said. A few other possible explanations for the recent resurgence: The chemical leaves your system soon after inhalation, and fairly recently (in 2011), the U.S. Food and Drug Administration approved new nitrous oxide equipment for delivery room use. "I instantly felt relaxed," Shauna Zurawski told ABC News. "Before, I was so tense. I was fighting against the contractions, which definitely wasn't good. But after the laughing gas, my body was able to do what it was supposed to. It was so neat." The more options a woman has in the delivery room, the better she'll be able to stake claim on what's going on in her body throughout childbirth. An inexpensive, safe, low-impact alternative to a giant $3,000 needle in the spine? Bring it on.